We currently have Lavender scented Body creme and will be making a batch of Coco Coconut scent. In lotions we have ; Plumeria, Honeysuckle, Baby Rose, Sugar Plum Fairy, Heather & Hyacinth and Roasted Almond Black Tea. We are donating all of our soap that is cured so I won't have any castile available for a couple of weeks. We will be making unscented as well as nut free in both lotion and creme after Christmas. Happy Shopping and Merry Christmas. We except Paypal, Visa and Master Card. Scents we carry include; Unscented, Plumeria, Honeysuckle, Lavender, Baby Rose, Sugar Plum Fairy, Peppermint Lavender, Vanilla, Cotton Sheets, Lime Tea, Mocha Mint, Island Escape, Rosehip Jazmine, Mocha Nut, Heather & Hyacinth and Black Tea. Holiday and Limited quantity fragrances; Spiked Nog, Winter Citrus, Vanilla Tea, and Harvest Time. Ingredients: Goat Milk(pasteurized), Distilled Water, oils( Avocado, Almond, Coconut), Emulsifying wax, Stearic acid, preservative(Phenonip) & fragrance(Essential Oils). Our Classic Castile Goat Milk Soap is only made with pure Olive Oil, Dead Sea Salt and saponified Raw Goats Milk. Bars weigh approx 4.5oz and can be purchased for $5ea. ​We have several scents and colors to choose from such as Lavender, Baby Rose, Lilac, Sugar Plum Fairy, Rosehip Jasmine and many other wonderful scents. Ingredients: Goat Milk Creme, Distilled Water, oils( Avocado, Almond, Coconut), butters(Mango, Shea, Cocoa), Ewax, Stearic acid, preservative(Phenonip) & fragrance(EO). Ingredients: Oils( Avocado, Almond, Coconut), butters(Mango, Shea, Cocoa), Cadillilia Wax, Ewax, Stearic acid, & flavor oil(Food Grade FO). Ingredients: Goat Milk Creme, Distilled Water, oils( Avocado, Almond), butters(Mango, Shea, Cocoa), Candillilia Wax, Ewax, Stearic acid, preservative(Phenonip) & fragrance(EO). These 100% Cotton Bath Clothes are hand crocheted, we have many different colors and designs to compliment your skin care products. 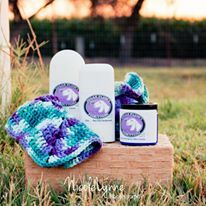 These 100% Cotton Soap Cozzies are hand crocheted, we have many different colors and designs to compliment your skin care products.